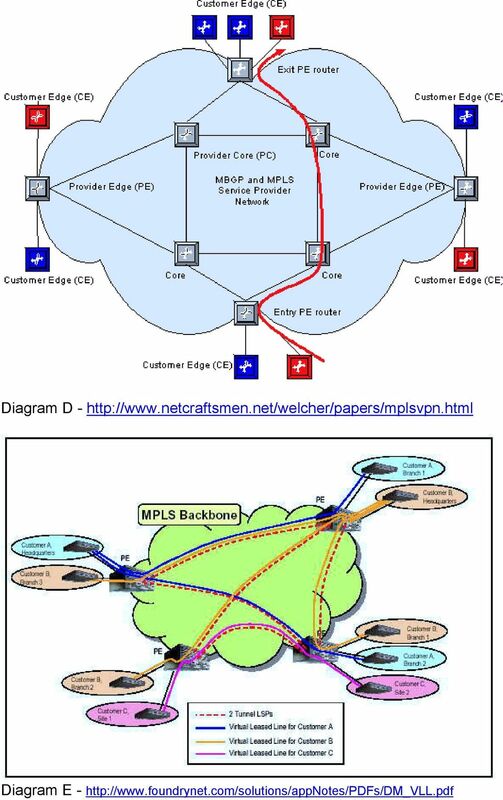 Download "(MPLS) MultiProtocol Labling Switching. 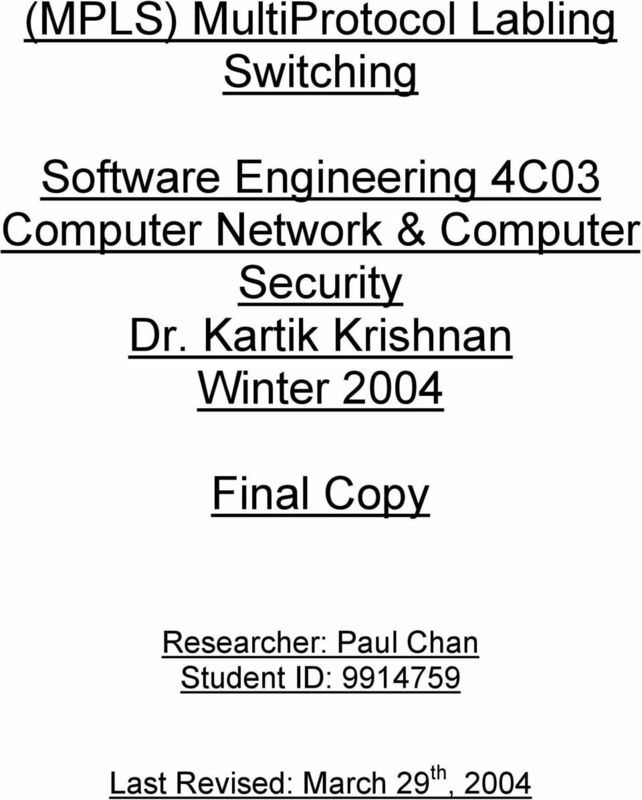 Software Engineering 4C03 Computer Network & Computer Security Dr. Kartik Krishnan Winter 2004." 2 4C03 Project Proposal Objective As computer networks become more and more a basic staple asset for both businesses and in general human communication. Since the adoption of the internet as a main medium of communication, we have noticed a correlating burden on the existing hardware and software system supporting these operations. We are beginning to see that our current IP switching router configurations struggle to satisfy all the bandwidth and network throughput requirements. In addition with the growth of online businesses, there is a push for added security measures to allow for transmission of sensitive data. MPLS is a hardware and software solution to this problem. By using newer networking hardware and smarter software algorithms to direct network data we can achieve more efficient, flexible and secure network communications. 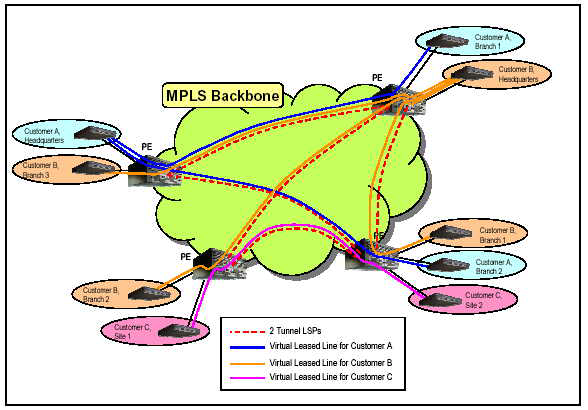 Approach In this report we will briefly describe what MPLS is and how it works. Moreover, we will discuss how MPLS features can improve current network conditions and lastly we will see an example of how MPLS impacts current technology. General knowledge about IP based routing and switching is assumed as we have studied these in our 4C03 Networking & Security course in great detail. Impact This report is intended to give this audience a brief introduction in the developing networking technology due to be released sometime in the summer of From this presentation the audience should be able to gain insight into the growth of network usage and the necessity for more efficient ways route information. It should be clear that newer technology is needed to replace the current technology if we wish to continue supporting increasing numbers of networked users and devices. Hence the need for new and cleaver ways to do the things we do on a daily basis. We will show that MPLS offers many different benefits in addition to the current IP network. It allows for network traffic engineering to ensure quality of service (QoS), reliability, security and data transfer efficiency. This list is only a mere fraction of the list of benefits MPLS brings to the IP based networking domain. In depth research is needed for one to understand the depth and breadth of the benefits MPLS brings to our current networking architecture. 3 What is wrong with what we have now? As the internet becomes the standard medium to carry information to and from their destination we will see traditional protocols and hardware be pushed to their operating thresholds. How do we solve the problem of increased demands for quality network bandwidth? How do we guarantee our packets will get from our sources to our intended destinations without loss delay and most importantly of all how can we know that are packets are traveling thru authorized secure networks? Traditional networking infrastructure relay packets of information via routers that determine the next best path each packet was to take. Based on different routing algorithms each packet was sent down the shortest path or quickest path whichever is deemed to be the priority. Each time a packet arrived at a router their fate would be determined by a routing table governed by complex algorithms. The most basic constructs of IP routing do not include considerations to the quality of network that the packet will travel nor does it take into account what is the most secure path a packet can take. It is only concerned with how it can get a packet to its destination while minimizing the distance (hops). 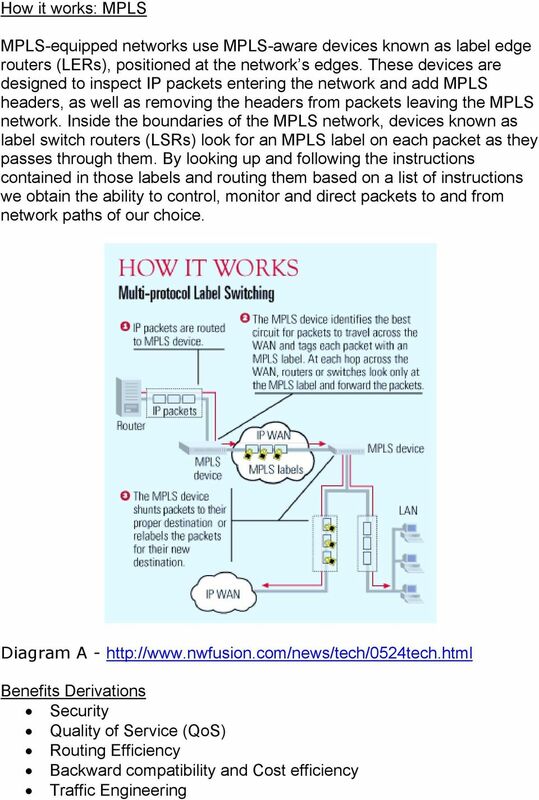 MPLS or Multi Protocol Label switch is the answer to our concerns above. Since traditional IP networks have no means of labeling, categorizing or monitoring the packets that traverse them it is nearly impossible to track and direct specific packets to ensure that priority packets get to their destination via the right channels. 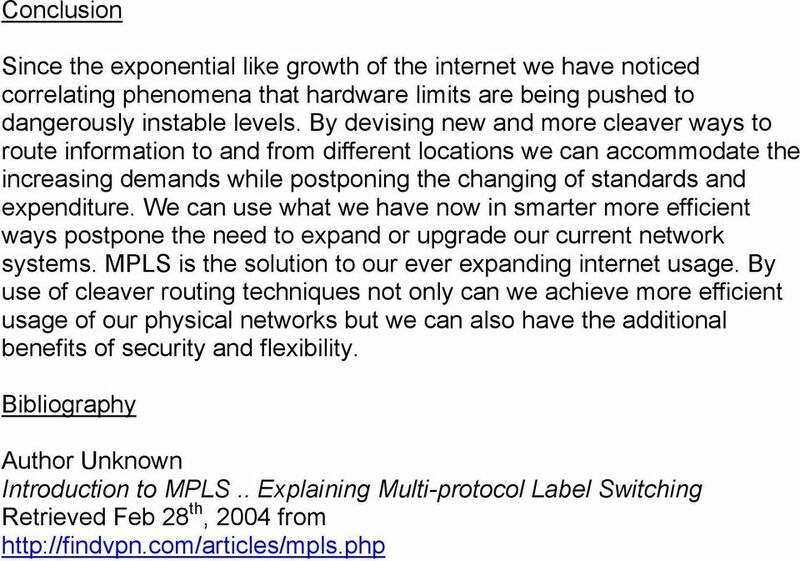 MPLS technology works to solve these IP shortcomings. What is MPLS MPLS is an overlay protocol, meaning that MPLS uses the existing structure of traditional IP switching enhanced with label or tags to aid in this new way of relaying packets. MPLS takes advantage of all the benefits of traditional IP switching and adds to it the benefits of network quality assurance and security management. 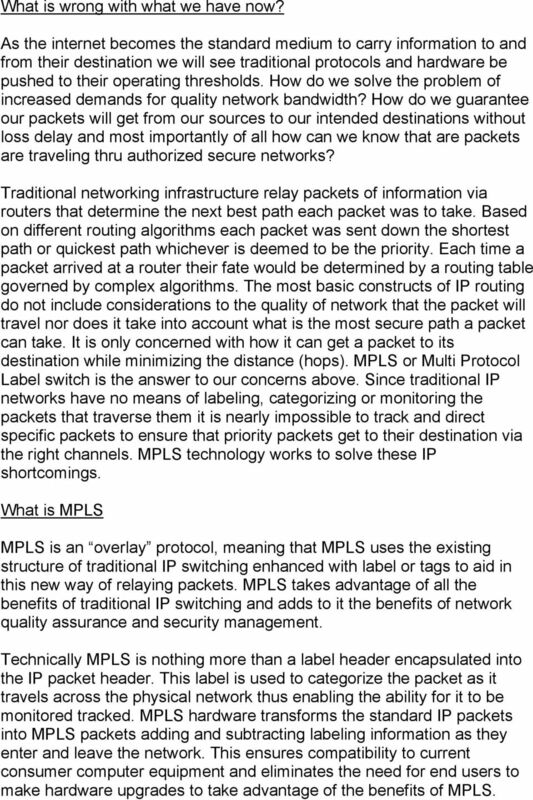 Technically MPLS is nothing more than a label header encapsulated into the IP packet header. This label is used to categorize the packet as it travels across the physical network thus enabling the ability for it to be monitored tracked. MPLS hardware transforms the standard IP packets into MPLS packets adding and subtracting labeling information as they enter and leave the network. This ensures compatibility to current consumer computer equipment and eliminates the need for end users to make hardware upgrades to take advantage of the benefits of MPLS. 6 Diagram C - As described in the diagrams above users create a tunneled secure connection to specific host servers passing thru unknown physical networks of the internet domain. Packets may very well travel thru networks belonging to malicious hackers. Even though this information is often encrypted hackers can and will find a way to intercept and decrypted messages that pass thru their networks. MPLS can mitigate this security threat completely. As network administrator you may be required to establish a VPN connection between two locations. The data sent maybe extremely sensitive. With MPLS and VPN technology you will be able to establish a connection and ensure that this information only travels via certain trusted networks. Doing so can ensure data is transferred safely, securely and efficiently. 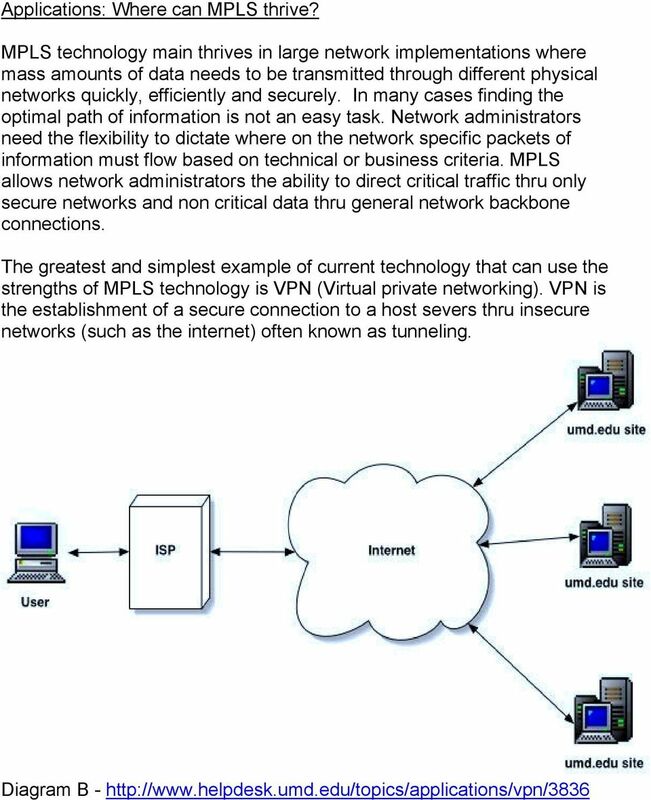 In the diagrams below you will see the concepts of VPN without MPLS and VPN with MPLS illustrated. The main difference is VPN connection established via MPSL will travel via Virtually Leased Lines (VLL). These lines are provided by large network service providers which ensure the lines are secure and always are of highest quality. WAN Optimization in MPLS Networks- the Transparency Challenge!